I hope you've been playing along with our birthday challenges and if you have, THANK YOU. If you haven't, why not start today with this easy peasy challenge. I'd love to see what you create! 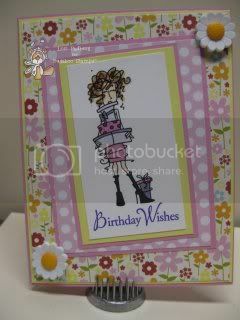 Fabulous card Lore, great image, love the floral papers. Fabulous card and great details. I saw this on MIM. So cute and fun! I love the papers you used. I’m dropping by from the Catered Crop. Your card is fabulous Lori. Love the flowers with the spotty dotty paper too! Gorgeous, love the image and papers. Thanks for joining Lexi's creations this time and good luck! Super cute card! Found your link from MIM!